Sarah's Heart's Home: Mother's Day Special for the Hair!!! Mother's Day Special for the Hair!!! I am so excited about this ONE day sale for Mother's Day!! 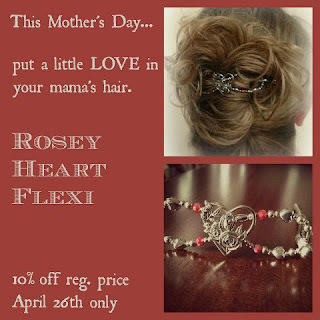 The Rosey Heart Flexi is the flexi clip that drew me into LillaRose.... It's just so elegant and pretty! What will this clip be????? Make sure and visit my website on Friday, April 26! !